The staff of in all things realizes there are varying views defining art. We asked three different artists to share their views and ideas with us. Do you agree with their views? Do you have more to add to their definitions? We’d love for you to join the conversation. Leave a comment below. 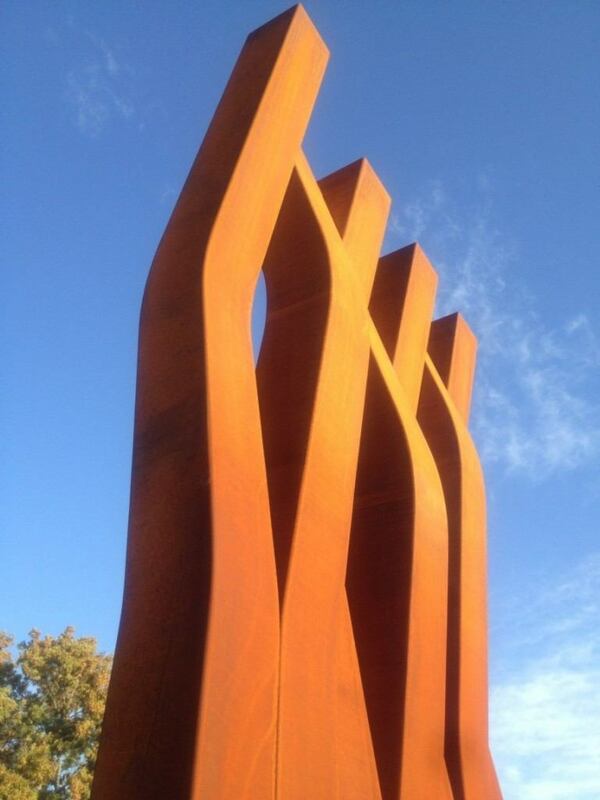 Enlaced: a Burning Bush, Psalm 19, COR-TEN Steel, 18’h x 8’w x 8’d, Dordt College Permanent Art Collection, 2013. In today’s visual culture art can represent virtually any idea and be made from practically any material. But despite the fact that artworks may look different today than they did in the past, we still mainly experience art by making objects and viewing images. Art can be figurative or it can be socially relational or contemplative; it can also exhibit a variety of other characteristics. The best Christian art communicates and projects a world that is implicitly meaningful and poignant. It is sentient and serves humanity in a way that values integrity and veracity. 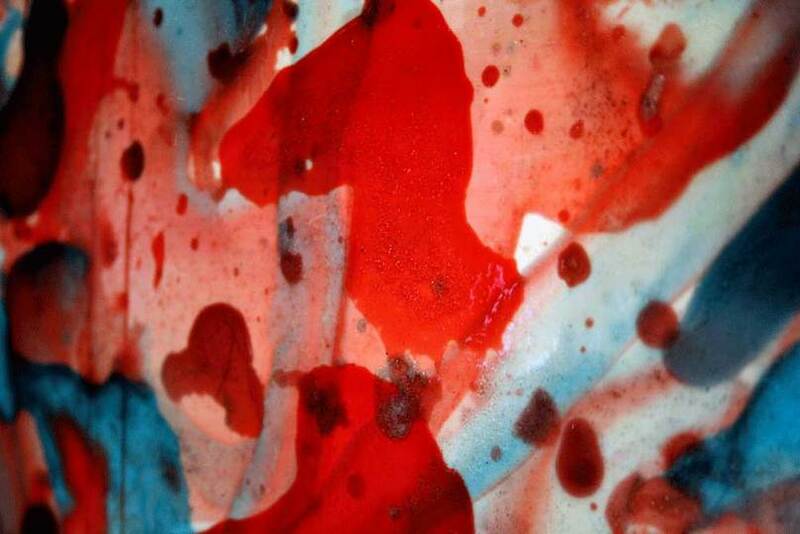 Art helps reveal and unfold the patterns woven into the structure of God’s creation. It is a gift of life and reminds us of God’s blessing and faithful covenantal grace. By working out of a biblical framework, Christian artists and their art humbly and sensitively engage the paradox of sin and redemption by representing a world of sorrow and joy with acute awareness and skill. Christian art may allude to the light of hope that can overcome pessimistic distrust. In doing so, artistic action becomes service to humankind and enriches life. The artistic spirit that drives the imagination of Christian art may evoke images of God’s creative work at the beginning of time. It can also honor the compassionate example of Jesus Christ by challenging indifference and cynicism and by respecting creational diversity. I primarily think of art as indexical in that it records thoughts, emotions, culture, and truth. This function is similar to how text records these same insights. Art, however, has the ability to create multiple meanings and address the complexity of the world in a single visual that can be viewed in a single moment. Though, high quality art asks the viewer to contemplate for far longer. Art as a non-literal form of communication makes it able to embody the complexity of Grace and the Fall simultaneously in one visual moment. I am concerned with the concept of labeling artwork as “Christian” and “not Christian” as this tends to reduce art to moralism, revering art that displays a positive, family friendly message created by a Christian artist and disregarding art that is more challenging or dark. This is problematic for me because the truth of the world, creation, fall, redemption, and restoration is dark as well as beautiful. Grace is beautiful but it came from a tragic event of Jesus dying on the cross. Only focusing on the beauty actually diminishes the beauty because it denies the whole. Even in our daily lives we experience happenings that are both tragic and beautiful. I was recently confronted with this reality in the events surrounding the birth of my son. He came 5 weeks early, the labor happened so quickly his father missed it by 7 hours, my son then spent a week in the NICU. Since then his underdeveloped facualties has made caring for him very challenging, but we love him and he is an amazing gift from God for which we are thankful everyday. Art is able to represent the complexities of simultaneously beautiful and tragic. I see art as a way to communicate in a more abstract format. Art is able to get at the complexity of God’s world and even provide direction for God’s plan for it. Art can be anything. I appreciate the traditional historical expectations for the visual arts, but I also fully embrace the latest derivations, ready to have my understandings stretched. Instead of then arguing in circles about how to define art, I find the more meaningful conversation to be “what makes for good art?”. With this in mind, I then believe that there are numerous criteria for good art, principles that give works a powerful resonance. And these criteria can readily be found now in the contemporary art scene of 2014. Online, in print and in person, I weekly encounter many artists whose work I would call good. The following are just a small sample of some of these tendencies in their projects. During the last 50 years, there has been a push in the art world to back away from the Romantic and later Modern notion of the artist as an autonomous genius. Instead, many artists find themselves rooted in communities, working with others and inviting participants into their process. This spirit sees art as participatory ritual, reacting against the notion of art as a commodity bought and sold in the marketplace. I see this social drive as a powerful statement that challenges the dominant materialism of culture and even more importantly, brings people together. I would call that good art. 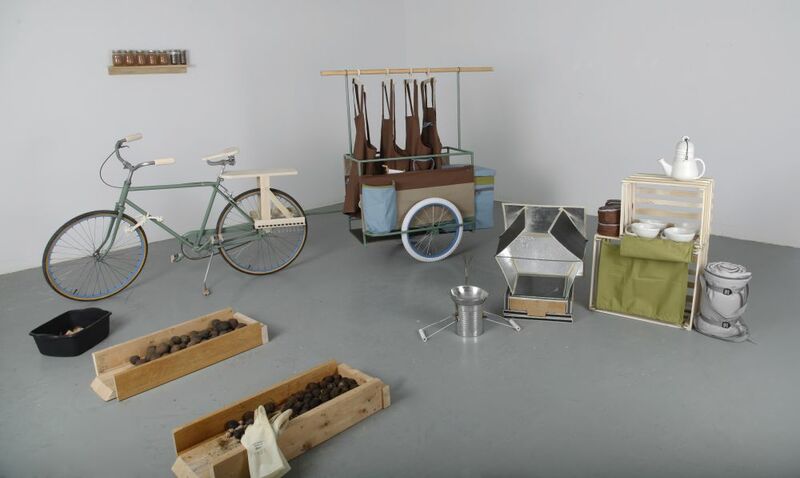 (for example, see Seitu Jones’s Create: The Community Meal here). Second, I see a tendency in art to question prevailing notions, to challenge cultural norms. Though this can be a difficult encounter, I find this questioning spirit to be essential as we humans too easily run on autopilot, not considering why we do what we do. Alan Jacob via William Deresiewicz offers an important phrase: Art can disturb our self-delight. We need powerful art to shake us up and question our assumptions because too often those assumptions are motivated by selfish desires instead of a desire to be like Christ. (for example: see Kara Walker’s powerful yet difficult recent show A Subtlety or the Marvelous Sugar Baby). That questioning spirit often makes for good art. And this touches on my last point as well – I believe that God can and does speak to us through the visual arts, his truth resonating through. My understanding of God’s common grace is that He allows this to generously happen, often in surprising situations and through sometimes surprising individuals. But, when the viewer encounters works of art with an open and humble spirit, we can be changed for the better. And good art strives to do that. David Versluis serves as a Professor of Art at Dordt College. Matt Drissell serves as an Associate Professor of Art at Dordt College. Sara Alsum-Wassenaar received her MFA in New Media at the University of Illinois at Urbana-Champaign. She holds a BA in Psychology and Art from Hope College and a Masters of Education from Grand Valley State University. In the summer of 2012, she rode the Empire Builder train from Chicago to Portland and organized stops along the way to meet with local historians and ceramic artists.